Fairfield Prep QB John Iaropoli throws a pass during football action against North Haven in Fairfield, Conn., on Saturday Nov. 10, 2018. The last time Fairfield Prep played in a CIAC state championship football game was 2013, but the last time it won a state title was back in 1988. Let’s look back on 1988 for a moment. The title for Prep was the third CIAC state championship won by the school on the gridiron. At the time, that gave them two more CIAC state titles than New Canaan who had only won one to that point, in 1982. In the time since Prep’s last title, New Canaan has won 11 CIAC state championships, appearing in 15 championship games. The Rams have won state championships in four of the last five years, all in Class L.
Now, New Canaan is looking to get to its first Class LL championship game, having moved up to the top division this season. Prep feels this version of its team is good enough to not only get it back in the championship game, but to win it all. The only time the two met on the field was in 1985 during a regular season clash won by the Rams. A lot has changed since then, but both programs sit on the precipice of getting back to a final. They will meet Sunday at 12:30 in Rafferty Stadium on the Fairfield University campus in the CIAC Class LL semifinals. No. 8 New Canaan reached the game by upsetting No. 1 Shelton 42-34 in the quarterfinals while No. 5 Prep went to No. 4 Southington, winning 28-21. That win coupled with New Canaan’s upset gave Prep one more home game and a chance to host a playoff game. If New Canaan is to reach the finals, it will do so having not played at home since beating Norwalk on Nov. 2. The Rams played at Ludlowe, took on Darien at Boyle Stadium in Stamford, traveled to Shelton and now pack up the buses once again heading to Rafferty Stadium. Marinelli said watching Prep on film, there is not much they do not do well. 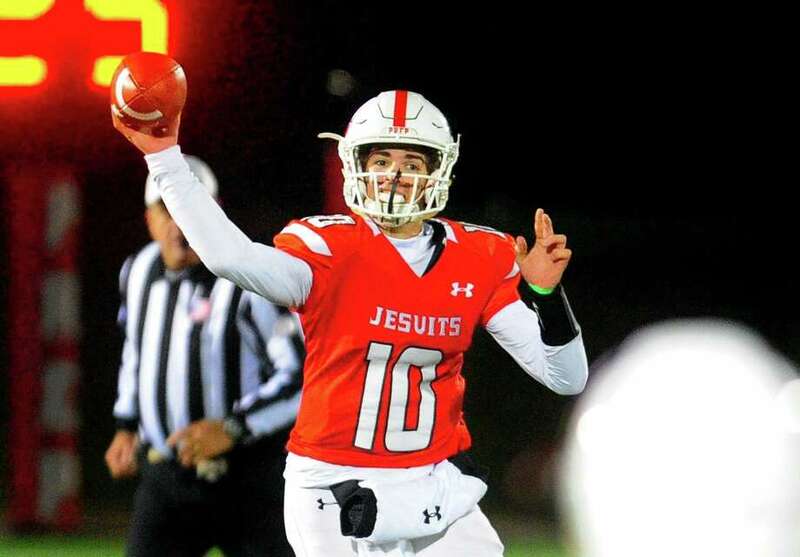 Jesuits running back Doug Harrison has run for 955 yards and 14 scores; senior receiver Finn Duran is averaging 22.4 yards per catch and has scored 14 TDs while Junior QB JP Iaropoli has thrown for 1,702 yards. New Canaan counters with Junior QB Drew Pyne who has thrown for 2,262 yards and 28 TDs and just three interceptions while moving to the top of the Rams all-time passing list. Quintin O’Connell, one of the state’s top receivers racking up 72 catches for 1,039 yards and 14 TDs while breaking Ram legend Pete Demmerle’s marks as New Canaan’s all-time leading receiver in catches, yards and touchdowns. The opportunity is in front of both teams, now they just have to grab it.